Bitesize Irish Gaelic – the site for learning Irish online – opened is web doors in August 2010. 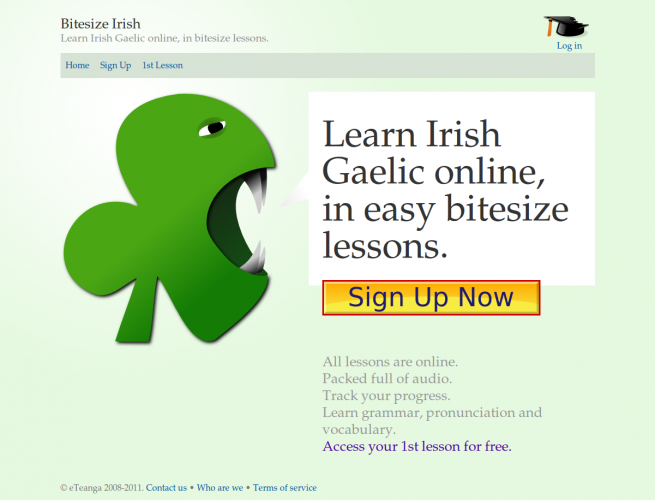 How Bitesize Irish Gaelic looked in 2010. We have more online lessons since then! The site was simpler back then. Perhaps that was a good thing! We phased out “Bitey” from the homepage that you see above. I think he was making little children cry. You’ll also notice we were called “Bitesize Irish” at the time. I prefer to call the Irish language as “Irish”. But many people call the language Irish Gaelic, or simply Gaelic. We wanted to be sure those people could find out that they can learn the language online. For that reason we decided to go for today’s name: Bitesize Irish Gaelic. Do you think it’s good that Bitey has been taken off the home page? I thought Bitey was cute, not scary at all. It’s not like he has mean eye brows, a crazed look and blood dripping from his teeth. However, the shamrock with the bite mark is cute too! Either way, suits me!